– Officially, at least, the 2012 product introductions won’t occur until trade show season. Eurobike takes place in late August, followed by Interbike in mid-September. But early summer — that is, now — is high season for previews and rumor-mongering. Sneak peeks have become the rule, not the exception. After having our first glimpse at the future, one innovation for 2012 overshadows all else: the electronic shifting of Shimano Ultegra Di2. By now it’s common knowledge that to ride Di2 is to become obsessed with its incomparable shifting. Its overpowering technological superiority makes it a lust-stoking, wallet-choking necessity. Shimano’s history suggests the functional experience of Ultegra Di2 will mirror that of Dura-Ace. The main differences are likely to be Ultegra’s slightly increased weight and less-polished aesthetics for Ultegra. Assuming that Ultegra’s shift quality is Dura-Ace-like, it will upend the bike industry next year for one crucial reason: Its expected price. First reports of Ultegra Di2 MSRP show it to be around 35% to 40% less than the cost of Dura Ace Di2. The biggest price disruption from Ultegra Di2 will come from how most bike manufacturers already price complete Ultegra complete bikes. For manufacturers, Ultegra bikes are like the Battle of Verdun: A bloodbath where no one wins. Companies like Specialized, Trek, and Cannondale tantalize their dealers about next year’s bike assortment with a small handful of key models that provide spectacular bang for the buck. Visit your local bike shop and you’ll see that Ultegra-equipped bikes are hands-down the best value. Do Specialized, Trek, and Cannondale make fat margins selling Ultegra bikes at such low prices? No. But by enthralling their dealers with two or three key models, they also get them on the hook for a much bigger assortment of higher margin models and ensure their brand gets the maximum footprint on the dealers’ sales floor. 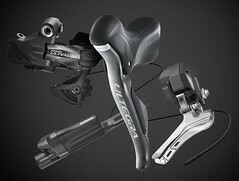 All indications are that manufacturers will use Ultegra Di2 bikes as their loss leader for 2012. We’ve heard word that carbon fiber, Di2-specific frames equipped with full Ultegra Di2 groups will retail starting at $3,500. Even in a quick test ride around a parking lot, Di2 is capable of brainwashing a customer faster than any frameset or wheelset technology ever could. Compared with the alternatives in the sub-$4,000 price range — SRAM Force, Campy whatever, and even mechanical Dura Ace — Ultegra Di2 should prove to be technologically dominant and allow for the easiest sales pitch ever. The only X-factor will be availability. Can Shimano produce sufficient quantity for what will inevitably be astronomical demand? If so, Ultegra Di2 will upend the bike market in 2012. – From the Department of Point vs. Counterpoint: The most impassioned thing written by a PRO in 2011 was published in VeloNews last week. Quite a different perspective from the fatalistic, and perhaps naïve view shown by this headline from ProCycling. – Did you know Active.com is public company? We had no idea here. Truth be told, they remind us a bit of Ticketmaster, with its disconnect between the size of their service charges and the relative simplicity of the services rendered. – May is the month of the Giro. July is the month of the Tour. Yet June isn’t wholly overshadowed by its bookends. Isn’t June a month of subtler glories? The miraculous discovery of new hometown roads. The sight of hollering, profanity, and embarrassing fisticuffs at the local Wednesday night crit and, blessedly, the spectacle doesn’t include you. Glories indeed. – l’affaire Armstrong is taking that familiar path of law-enforcement-accelerated celebrity disintegration, as previously paved by John DeLorean, Martha Stewart, Barry Bonds, and Lindsay Lohan. Hubris begets tragedy; tragedy begets farce; farce begets complete public apathy to the spectacle as a whole. Each of us has our own perspective, but the most lasting legacy may be the recent lesson taught about criminal defense, courtesy of the always-entertaining-and-informative Race Radio (a highly recommended Twitter feed) — the apparent choice by Lance Armstrong to employ the Chewbacca Defense. Another perspective comes from Neal Browne, who wrote about why despite the ugly mess he won’t be pulling down his Lance posters anytime soon. His point is a legitimate one: Regardless of how doped Lance (or for that matter, the majority of the peloton) was from ’99-’05, many of us derived huge joy from those years, and the secrets and sins or our former heroes shouldn’t, de facto, nullify our memories of that bygone joy. What’s your fondest memory of The Tainted Era? For me one stands out above all others: The incomprehensibly bionic attack of the US Postal Team at the bottom of Alpe d’Huez in the 2003 Tour de France. It had the fury and the mob-like muscle of Cipo’s leadout train. It was literally orchestral in its teamwork. And it took place at a point (the stage had crossed multiple mountain passes already) where GC vulnerability was at a peak.